I have drawn myself deck plan shapes and made them in to ViSiO for Windows, stencils. These are designed to match the style of the Original Traveller® game. Based round a 1.5m square. These stencils were created with Visio 2000. Within the zip file is a template workspace, three Stencils and a sample completed Spaceship. The three stencils are Starship, Starship labels and Traveller. This contains all the elements to create a ship. Various shapes to create hulls, cabins and doors. This is just the standard parts of a Traveller space ship. They are set in a font size to match the standard template scale. It saves having to create exactly the same text for all your ships. Just drag and drop these in place. Also on this stencil are various keys to the symbols to include on your finished plans. This contains standard ships that are used regularly as ships boats or as the basis for a modified ship. (At the moment there is only one Launch.) You can add you own small ships to this stencil. 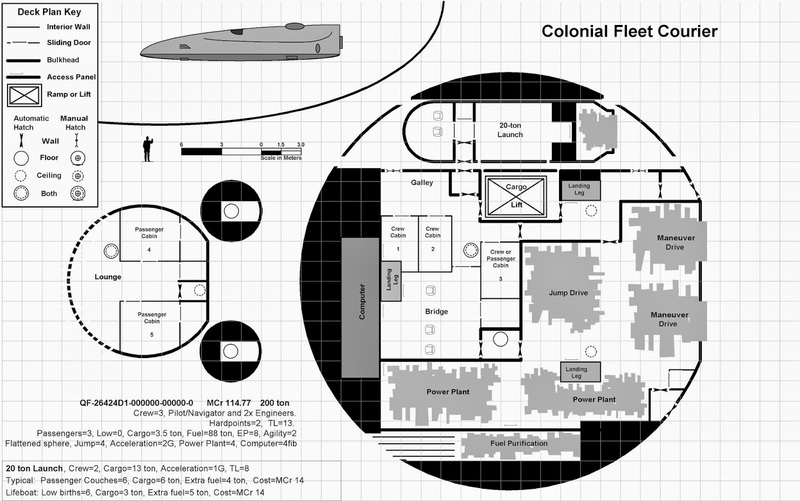 As all the Sci-Fi objects are created to scale, all of the other Stencils included with Visio can be used on your Space ships plans. The office layout shapes, funiture and Bathrooms and kitchen stencils provided by the Technical edition of Visio 2000 are all compatible with the Starship stencils. Although Traveller Deck plans do not normally include furniture, you could elaborate on a standard plan and add furniture details using the standard ViSiO stencils. As long as you own a copy of Microsoft Visio you may use the drawings for any purpose.